The Build Quality of this small 5 Watt Combo is Superb. Quality Components and Decent Double-Sided PCBs - All Steel Chassis with Good Transformers. The Cabinet (MDF) has a Great 'Retro' Look with Very Solid, Reinforced Construction and a nice Vintage style Carry Handle. The Front Panel Features- Input, Gain, Tone, Volume and Reverb Controls plus A Nice Jewel Pilot Light and Toggle (On/Off) Power Switch. The Rear Panel has a Multi-Impedance Speaker Output, Power (Speaker) Attenuator and Headphone Socket. The Amp is about the same size as the old Epiphone Valve Junior. The Amps 'Audio Path' is all Valve, Class 'A', Single Ended, Cathode Bias - using a '12AX7' Preamp and 'EL84' Power Valve. The 'Reverb' is Digital and is Held on a small PCB of it's own (Standard V5). The Reverb Circuit runs 'Parallel' to the Valve Amplifier and at NO time is the Main Analogue 'Audio' Signal converted to Digital. The Reverb Sounds Very Good. When you open the Amp up - The Inside actually Looks Like a Valve Amp. So many of the New Breed of 'Chinese' Valve Amps have a PCB that looks like it would be more at home in your Laptop (Standard V5). There are a Few 'Issues' with the Stock Amp but nothing too Serious - The Amp has a Nasty 'Mains' Hum when you switch it on - The Power (Speaker) Attenuator is a Total waste of time and The Headphone Output is useless. The 'Voice' of the Amp is better suited to a 'Strat' or 'Tele' type Guitar, in standard form it is not 'Les Paul' friendly. With a Few RAT Modifications the Amp becomes Superb, Sounds Good with ANY type of Guitar and is a Great Little Bedroom Amp. Plenty of 'Clean' and Loads of 'Crunch'. The Stock RED 'Bugera' V5 Speaker has recently been upgraded to a BLUE 'Turbosound' (TS-8G120A4) and once the RAT Modifications are done, it sounds very good and does not need replacing. It can be replaced with a Celestion 'Eight-15' for a bit more of a 'Rock' Sound, if required. Recently introduced (2014) to Replace the 'Standard V5' is the New 'Infinium V5'. The Infinium uses a 'Digital Valve Monitoring Circuit' designed to 'Shut Down' the Power Output Valve in the event of any Overload - (Details of how the system works are shown at the bottom of this page). This is a Total waste of time on a '5w - Single Ended - Cathode Bias' Amp as the last thing you want is the Amp to shut down when it's overloaded, that is the Main purpose of a 5w Valve Amp (It's all Marketing BS designed to compete with 'TubeSync'). The RAT Modifications can be fitted on the Infinium V5 but the 'Digital Monitoring' needs to be disabled in order for the Amp to function correctly. The Overall PCB Layout is different as the 'Digital Reverb' is now located on the Main PCB and not on it's own independant Plug-In Card, plus a lot more of the Components are 'SMT' (Minature Surface Mount Parts). The Amp uses the New 'Turbosound' Speaker. Build Quality is Good, the Infinium Amp still has the same problems as the Old Amp but responds well to the RAT Modifications. 1. - The Stock Speaker Attenuator has been Replaced with RAT 'OPR'. The switch on the Rear Panel of the Amp has been removed and A 'Rotary' OPR control fitted on the Front Panel of the Amp. You can now Vary the Output of the Amp from 'Zero-to-Full Power'. 2. - Power On/Off and 'Twin-Rectifier' - 3 Position Switch located on the Rear Panel of the Amp. 3. - The Stock 'Turbosound' Speaker can be replaced with a New Celestion 'Eight-15' for more of a 'Rock' Sound, if required. Not really necessary as the 'Turbosound' Speaker is WAY better than the Old RED Bugera Speaker. 4. - RAT 'Bias' and 'Gain' Switches - This gives 9 Combinations of 'Voice' Settings on the Amp. From 'Clean' to Major 'Crunch' - It makes the Amp a lot more Versatile with a High Chance that you can find the Sound you want. A 'Bright' Switch is also included. 5. - The Stock Amp has an Annoying 'MAINS HUM' which also makes it useless in a Studio. This 'Issue' is corrected and the Amp is now Silent - NO Background Noise. 6. - The Speaker Output Socket is fitted with an Auto-Switching 'Dummy Load'. This will protect the Amp from any damage that may be caused by switching 'On' without a Speaker Connected. It also allows the use of 'Headphones' -or- 'Line Out' (or Both) with-or-without the main Speaker Connected. 7. - The Stock 'Headphone' circuit is replaced and the Headphone Socket now works as it should. 8. - There are several 'Other' Modifications I do that Enhance both Performance and Reliability. 9. - All Amps are supplied with a RAT User Manual detailing all of the Modifications. 10. - All Amps are 'PAT' Approved. 11. - Dedicated 'Line Out' Socket. The 'Line Out' signal is taken from the Output Transformer. Optional Upgrade - The Amp can be upgraded to 10 Watts RMS using a Fender Blues Junior Output Transformer and additional EL84 Power Valve, running in 'Push-Pull', 'Self-Split', 'Auto-Bias' Mode. This gives the Amp a real 'Kick' and increases the available Clean Headroom. The Speaker must be upgraded to a Celestion 'Eight-15, 16 Ohms'. Please 'Contact' me for details. The V5 Infinium (INF) Amp is a Marketing Gimmick and the way it has been implemented is questionable. Basically all it does is shut Down the Power Output Valve in overdrive conditions which is exactly what you don't want on a 5W Single-Ended, Cathode Bias Amp. The Very nature of a SE, CB Amp is that the Valve is it's own Power Regulator, automatically adjusting to suit the Load. The INF circuit in this Amp has little use other than (perhaps) extending the life of the Power Valve. Like a Car, if you don't drive it, it will not wear out. If the Valve develops an internal fault (short) it will Blow the Supply Fuse, regardless of any INF intervention. 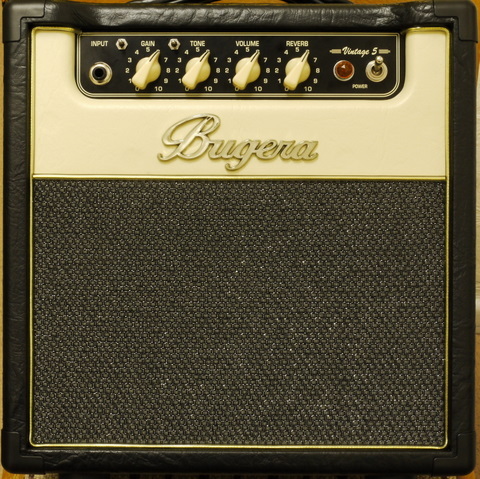 I think Bugera would have made better use of their time and effort removing the Hideous 50Hz Mains Hum that all of these Amps suffer from (Caused by a Basic Design Error). In my personal opinion, putting a microprocessor controlled, digital regulator in this particular Amp is pointless. This is how it works - Tested with a 1vpp Sine-wave Input and the Output sent to a dummy load monitored on an Oscilloscope ----- At 5w RMS Output the INF circuit does nothing, if the Amp is increased to Full Power (Full Clip - Square Wave Output [distortion]) it produces 9.45 Watts Peak Power, this is the main purpose of a 5w Amp, Harmonic Distortion at Lower Volume Levels. The INF Circuit now Kicks in by Creating (and Increasing) A Negative Bias at the Valve (Input) Grid, and over a period of about 2 minutes, shuts the Output of the Amp down to 4.72 Watts, Massively distorting the 'Square Wave' output to something resembling a 'Triangle Wave', at which time the Front Pilot Light Flashes and the Rear INF RED LED Illuminates, indicating a Fault. It operates slowly so that your ears can not easily detect the change. When the Volume Control of the Amp is returned to what was the 5 Watt RMS Position, the Output of the Amp is now 2.3 Watts RMS and it takes over 4 minutes for the Amp to recover back to 5 Watts. To my ears, the Digital INF Circuit causes a type of 'Tremolo' effect on the Output, and they all do it. Any RAT Modifications to this Amp will include 'Disabiling' the INF System. Keep in mind that this is under Test conditions and the Operation of the Amp will be different with a Guitar Input, also, the INF system may have a valid use in a different type of Valve Amp Design.